Being designed for straight-line drag racing, while remaining street legal. Muscle cars were originally referred to as "Supercars" in the United States, often (though not always) spelled with a capital S." From the mid-1960s to the mid-1970s, "dragstrip bred" mid-size cars were equipped with large, powerful V8 engines and rear-wheel drive were referred to as Supercars more often than muscle cars. An early example is the 1957 Rambler Rebel, which was described as a "potent mill turned the lightweight Rambler into a veritable supercar." In 1966, the supercar became an official industry trend" as the four domestic automakers "needed to cash in on the supercar market" with eye-catching, heart-stopping cars. Examples of the use of the supercar description for the early muscle models include the May 1965 Car Life road test of the Pontiac GTO along with how "Hurst puts American Motors into the Supercar club with the 390 Rogue" (the SC/Rambler) to fight in "the Supercar street racer gang" market segment, with the initials "SC" signifying SuperCar. The supercar market segment in the U.S. at the time included special versions of regular production models that were positioned in several sizes and market segments (such as the "economy supercar"), as well as limited edition, documented dealer-converted vehicles. However, the supercar term by that time "had been diluted and branded with a meaning that did not respect the unique qualities of the 'muscle car'." Opinions on the origin of the muscle car vary, but the 1949 Oldsmobile Rocket 88, is often cited as the first muscle car. The Rocket 88 was the first time a powerful V8 engine was available in a smaller and lighter body style (in this case the 304 cu in (5.0 L) engine from the larger Oldsmobile 98 with the body from the six-cylinder Oldsmobile 76). The Rocket 88 produced 135 hp (101 kW) at 3,600 rpm and 263 lb⋅ft (357 N⋅m) at 1800 rpm and won eight out of ten races in the 1950 NASCAR season. The Rocket 88's Oldsmobile 303 V8 engine (along with the Cadillac 331 engine, also introduced in 1949) are stated to have "launched the modern era of the high-performance V-8." 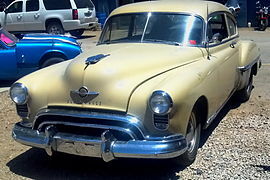 Another predecessor to the muscle car was the Hudson Hornet, introduced in 1951. The 1954 Hornet with the "Twin-H-Power" option of dual carburetors producing 170 hp (130 kW) from its 308 cu in (5.0 L) six-cylinder engine. In 1955, the Chrysler C-300 was introduced, which produced 300 hp (224 kW) from its 331 cu in (5.4 L) V8 engine, and was advertised as "America's Most Powerful Car". Capable of accelerating from 0 to 60 mph (97 km/h) in 9.8 seconds and reaching 130 miles per hour (209 km/h), the 1955 Chrysler 300 is also recognized as one of the best-handling cars of its era. The Rambler Rebel, introduced in 1957, is the first intermediate-sized car to be available with a big-block V8 engine. It is therefore considered by some to be the first muscle car. With a 327 cu in (5.4 L) V8 engine producing 255 hp (190 kW), its 0-60 mph acceleration of 7.5 seconds made it the fastest stock American sedan at the time. The popularity and performance of muscle cars grew in the early 1960s, as Mopar (Dodge, Plymouth, and Chrysler) and Ford battled for supremacy in drag racing. The 1961 Chevrolet Impala offered an SS package for $53.80, which consisted of a 409 cu in (6.7 L) V8 engine producing 425 hp (317 kW) and upgraded brakes, tires and suspension. The 1962 Dodge Dart 413 (nicknamed Max Wedge) had a 413 cu in (6.8 L) V8 which produced 420 hp (313 kW) and could cover the quarter mile in under 13 seconds. In 1963, two hundred Ford Galaxie "R-code" cars were factory built specifically for drag racing, resulting in a full-size car which could cover the quarter mile in a little over 12 seconds. Upgrades included fiberglass panels, aluminum bumpers, traction bars and a 427 cu in (7.0 L) racing engine conservatively rated at 425 hp (317 kW). The road legal version of the Galaxie 427 used the "Q-code" engine which produced 410 hp (306 kW). The following year, Ford installed 427 engine in the smaller and lighter Fairlane body, creating the Ford Thunderbolt. The Thunderbolt included several weight-saving measures (including acrylic windows and fibreglass/aluminium body panels and bumpers) and a stock Thunderbolt could cover the quarter-mile in 11.76 seconds. The Thunderbolt was technically road legal, however it was considered unsuitable for "for driving to and from the (drag)strip, let alone on the street in everyday use". A total of 111 Thunderbolts were built. The General Motors competitor to the Thunderbolt was the Z-11 option package for the full-size Chevrolet Impala coupe, of which 57 examples were produced in 1963 only. The Z-11 Impala was powered by a 427 cu in (7.0 L) version of the W-series big-block engine, which was officially rated at 430 bhp (321 kW). With a compression ratio of 13.5:1, the engine required high-octane fuel. The RPOZ-11 package also included weight reduction measures such as an aluminum hood and fenders, the removal of sound-deadening material and the deletion of the heater and radio. In 1964, a drag racing version of the Dodge 330 was created, called the "330 Lightweight". It was powered by a 426 cu in (7.0 L) version of the Hemi racing engine which was official rated at 425 hp (317 kW) but rumoured to have an actual power output higher than this. Weight reduction measures included an aluminium hood, lightweight front bumpers, fenders and doors, Lexan side windows and no sound deadening. Like other lightweights of the era, it came with a factory disclaimer: "Designed for supervised acceleration trials. Not recommended for general everyday driving because of the compromises in the all-round characteristics which must be made for this type of vehicle." Also using the 426 Hemi racing engine was the limited production 1965 Plymouth Satellite 426 Hemi. In 1966, the racing version of the 426 Hemi was replaced by a detuned "Street Hemi" version, also with a size of 426 cu in and an official power rating of 425 bhp (317 kW)). The 1966 Plymouth Satellite 426 Hemi could run a 13.8-second quarter mile at 104 mph (167 km/h) and had a base price of $3,850. The Pontiac GTO, a car often considered to have strongly influenced the muscle car era, was introduced in 1964 as an optional package for the intermediate-size Pontiac Tempest. The GTO was developed by Pontiac division president John DeLorean and was initially powered by a 389 cu in (6.4 L) V8 engine producing 325 hp (242 kW). The success of the GTO led other GM divisions to develop muscle cars based on intermediate-sized platforms: the 1964 Oldsmobile 442, 1964 Chevrolet Chevelle SS and 1965 Buick Gran Sport. The AMC V8 engine was enlarged to 390 cu in (6.4 L) in 1968, which produced 315 hp (235 kW) and was first used in the 1968 AMC Rebel SST, AMC Javelin Go-package and AMC AMX. A key appeal of muscle cars was that they offered the American car culture relatively affordable and powerful street performance in models. But as size, optional equipment and luxury appointments increased, engines had to be more powerful to maintain performance levels, and the cars became more expensive. As a response to this rising cost and weight, some "budget" muscle cars began to appear, such as the 1967 Plymouth GTX, the 1968 Plymouth Road Runner and the 1968 Dodge Super Bee. The Plymouth Barracuda was one of the first muscle cars to be based on the smaller compact car body size. The Barracuda was based on the Plymouth Valiant and from 1968 was available with a 383 cu in (6.3 L) V8 engine producing 300 hp (224 kW). It could run a quarter mile in 13.33 seconds at 106.50 mph (171.40 km/h)on the drag strip. The base price was $2,796.00; the price as tested by Hot Rod was $3,652. The related 1970 Plymouth Duster was powered by a 340 cu in (5.6 L) V8 engine producing 290 hp (216 kW). Performance figures were 0 to 60 mph (97 km/h) in 6.0 seconds and the quarter mile time of in 14.7 seconds at 94.3 mph (151.8 km/h). Although muscle cars sold in relatively small volumes, manufacturers valued the halo effect of the publicity created by these models. Competition between manufacturers led to a horsepower war that peaked in 1970, with some models advertising as much as 450 hp (336 kW). The 427 cu in (7.0 L) Chevrolet L72 big-block engine became available in the mid-sized Chevrolet Chevelle in 1969 as the COPO 427 option. The 427 Chevelle could run a 13.3 sec. quarter-mile at108 mph (174 km/h). Chevrolet rated the engine at 425 hp (317 kW), but the NHRA claimed power output to be 450 hp (340 kW). The following year, the "Chevelle SS 454" model was introduced, which used the 454 cu in (7.4 L) Chevrolet LS6 big-block engine rated at 450 hp (336 kW), the highest factory rating at that time. In 1969, the Plymouth Road Runner was awarded Motor Trend magazine's Car of the Year. With optional performance parts such as intake and exhaust manifolds, upgraded carburetor, and drag-racing tires, the Road Runner had a quarter mile time of 14.7 quarter at 100.6 mph (161.9 km/h). In this customized form, the cost of the Road Runner was US$3,893. The fastest muscle car produced by American Motors was the mid-sized 1970 AMC Rebel "The Machine", which was powered by a 390 cu in (6.4 L) engine producing 340 hp (254 kW). The Rebel had a 0-60 mph (97 km/h) time of 6.8 seconds and a quarter mile in 14.4 seconds at 99 mph (159 km/h). The popularity of muscle cars declined through the early 1970s, due to factors including the Clean Air Act, the fuel crisis and increasing insurance costs. The 1973 oil crisis resulted in rationing of fuel and higher prices. Muscle cars quickly became unaffordable and impractical for many people. In addition, the automobile insurance industry levied surcharges on all high-powered models. Prior to Clean Air Act of 1970, a majority of muscle cars came optioned with high-compression engines (some engines were as high as 11:1), which required high-octane fuel. Prior to the oil embargo, 100-octane fuel was common. However, following the passage of the Clean Air Act of 1970, octane ratings were lowered to 91 (due in part to the removal of lead as a valve lubricant). Manufacturers were forced to reduce the compression ratio of engines, resulting in reduced performance. Simultaneously, efforts to combat air pollution focused Detroit's attention on emissions control rather than increased power outputs. Muscle car performance began a resurgence in the early 1980s with high output V8 engines introduced for the Ford Mustang GT, Chevrolet Camaro Z28 and Pontiac Firebird Formula/Trans Am. Initially using four-barrel carburetors, engine performance and fuel economy was increased by the mid-1980s using electronic fuel injection systems and advanced engine management controls. Muscle car performance began to reappear on intermediate two-door coupés such as the Chevrolet Monte Carlo SS and Buick Regal. The Buick Regal used turbocharged V6 engines on the Grand National, Turbo-T, T-Type, and GNX models which rivaled the performance of V8 engines. The few muscle cars remaining in production by the mid-1990s included the Ford Mustang, Chevrolet Camaro, and Pontiac Firebird. For 2004, the Pontiac GTO was relaunched in the United States as a rebadged captive import version of the Holden Monaro. For 2005, Chrysler introduced muscle car heritage to high performance V8 powered versions of four-door sedans, the Dodge Charger and Chrysler 300C, using nameplates traditionally used for two-door muscle cars. 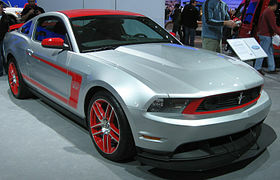 For 2005, the fifth-generation Ford Mustang, designed to resemble the original first-generation Mustang, brought back the aggressive lines and colors of the original. For 2006, GM relaunched the Chevrolet Monte Carlo SS with a V8 the first V8 on the Monte Carlo in 15 Years, with the same V8 engine used on the Monte Carlo's W-Body sister cars like the Pontiac Grand Prix GXP, Buick Lacrosse Super, and the Chevrolet Impala SS. For 2008, Chrysler re-introduced the Dodge Challenger, which features styling links to the 1970 first-generation Challenger and was claimed by the Chrysler CEO to be "a modern take on one of the most iconic muscle cars". A year later, running on that same sentiment, Chevrolet released the 2009 Camaro, which bears some resemblance to the 1969 first-generation Camaro. The first Australian-designed car to be marketed as a performance model was the 1963 Holden EH S4 model, of which 120 road cars were produced so that the model could be eligible to compete at the 1963 Armstrong 500 motor race at Bathurst. The EH S4 was powered by an upgraded version of the standard six-cylinder engine, enlarged to 2.9 L (179 cu in) and producing 90 kW (121 bhp). In 1964, the Ford Falcon (XM) became available with an enlarged 3.3 L (200 cu in) "Super Persuit" version of the standard six-cylinder engine, which produced 90 kW (121 bhp). In 1965, the Chrysler Valiant AP6 became the first Australian car to be available with a V8 engine. This optional engine was the 4.5 L (273 cu in) version of the Chrysler LA engine, which produced 135 kW (181 bhp) and was imported from the United States. The first Australian-designed Ford to be available with a V8 was the 1966 Ford Falcon (XR), with a 4.7 L (289 cu in) version of the Ford Windsor engine (imported from the United States), which produced 149 kW (200 bhp). The first Holden to be available with a V8 was the 1968 Holden HK, with a 5.0 L (307 cu in) version of the Chevrolet small-block V8 (imported from the United States) which produced 157 kW (210 bhp). Later that year, a 5.4 L (327 cu in) version of the engine became available in the Holden HK Monaro GTS 327 coupe. The pinnacle of 1970s Australian muscle cars were the 1971–1972 Ford Falcon GTHO, Holden Monaro 350 and Chrysler Valiant Charger R/T (the smaller Holden Torana GTR was also a successful performance car of the era, but it is not considered a muscle car due to its prioritisation of light weight over outright power). The Ford Falcon (XY) GTHO Phase III model was powered by a 5.8 L (351 cu in) version of the Ford Cleveland V8 engine, officially rated at 224 kW (300 bhp), but estimated to produce between 261–283 kW (350–380 bhp). The Holden HQ Monaro GTS 350 was powered by a 5.7 L (350 cu in) version of the Chevrolet small-block V8 producing 205 kW (275 bhp). The Chrysler Valiant Charger R/T E49 model was powered by a 4.3 L (265 cu in) version of the Chrysler Hemi-6 six-cylinder engine producing 225 kW (302 bhp). In 1972, production of Australian muscle cars came to an abrupt halt when Supercar scare caused Ford, Holden and Chrysler to cease development of upcoming performance models, due to government pressure. The few Australian muscle car models produced after 1972 consist of the limited production 1977–1978 Holden Torana (LX) A9X option and the 1978–1979 Ford Falcon (XC) Cobra model, both created as homologation models for Group C touring car racing. Wikimedia Commons has media related to Muscle cars. ^ Koch, Jeff (1 October 2004). "The First Muscle Car: Older Than You". Hemmings Muscle Machines. Retrieved 18 January 2016. ^ "Muscle Car History". www.classic-car-history.com. Retrieved 12 February 2019. ^ a b c d "Muscle Car Definition". Muscle Car Club. Retrieved 18 January 2016. ^ "Muscle Car Definition: Understand the Requirements". www.carsdirect.com. Retrieved 9 February 2019. ^ a b c "Super-iority: Defining the Supercar and Muscle Car". www.ateupwithmotor.com. 28 July 2009. Retrieved 9 February 2019. ^ "muscle car". Merriam-Webster Online. Retrieved 18 January 2016. ^ Sherman, Don (4 June 2006). "Muscle Cars Now Worth Millions". The New York Times. Retrieved 18 January 2016. ^ "Classic Muscle Cars Library". How Stuff Works. Archived from the original on 4 November 2015. Retrieved 18 January 2016. ^ "Muscle Car Definition". Muscle Car Society. Archived from the original on 22 July 2012. Retrieved 18 January 2016. ^ "Muscle car definition and meaning". collinsdictionary.com. Retrieved 9 February 2019. ^ Mueller, Mike (1997). Motor City Muscle: The High-Powered History of the American Muscle Car. MBI Publishing. p. 13. ISBN 978-0-7603-0196-8. Retrieved 18 January 2016. ^ a b Henshaw, Peter (2004). Muscle Cars. Thunder Bay Press. ISBN 978-1-59223-303-8. ^ Severson, Aaron (27 July 2009). "Super-iority: Defining the Supercar and Muscle Car". ateupwithmotor. Retrieved 21 May 2016. ^ Harless, Robert (2004). Horsepower War: Our Way of Life. iUniverse. p. 1. ISBN 978-0-595-30296-3. ^ Gunnell, John (2001). Standard Guide to American Muscle Cars: A Supercar Source Book, 1960–2000. Krause Publications. ISBN 978-0-87349-262-1. ^ Norbye, Jan P.; Dunne, Jim (October 1966). "The Hot Ones: Supercars of medium size flaunt tough suspensions, great brakes, most powerful engines in existence". Popular Science. 189 (4): 83–85. Retrieved 21 May 2016. ^ Auto Editors of Consumer Guide (22 August 2007). "1957-1960 Rambler Rebel". howstuffworks.com. Retrieved 21 May 2016. ^ Campisano, Jim (1995). American Muscle Cars. MetroBooks. p. 91. ISBN 978-1-56799-164-2. ^ "Rambler Scrambler". Car Life. 16: 33–36. 1969. Retrieved 21 May 2016. ^ "Rambler Scrambler". Car and Driver. 14: 84. 1968. ^ Lyons, Dan; Scott, Jason (2004). Muscle Car Milestones. MotorBooks/MBI Publishing. p. 89. ISBN 978-0-7603-0615-4. Retrieved 21 May 2016. ^ Bonsall, Thomas E. (1985). Muscle Plymouths: The Story of a Supercar. Bookman Publishing. ISBN 978-0-934780-71-1. ^ Primedia (2004). Hot Rod Magazine: Muscle Car Files. MotorBooks International. p. 112. ISBN 978-0-7603-1647-4. ^ Carner, Colin (February 1999). "1967 Chevrolet Stage III Nickey Camaro". Sports Car Market. Retrieved 21 May 2016. ^ JEL. "Why are "muscle cars" called so?". Stack Exchange. Retrieved 21 May 2016. ^ Nerad, Jack. "Oldsmobile Rocket 88". Driving Today. Archived from the original on 4 July 2017. Retrieved 18 January 2016. ^ a b Auto editors ofConsumer Guide (16 January 2007). "The Birth of Muscle Cars". musclecars.howstuffworks.com. Retrieved 18 January 2016. ^ Dulcich, Steve. "Rocket Man". Popular Hot Rodding. Archived from the original on 18 January 2016. ^ "Chrysler 300 History". www.edmunds.com. Archived from the original on 11 November 2016. ^ Truesdell, Richard. "John Goergen's 1966 343 prototype (sidebar)" (PDF). Musclecar Enthusiast: 59. Retrieved 18 January 2016. ^ Auto editors of Consumer Guide (22 August 2007). "1957-1960 Rambler Rebel". auto.howstuffworks.com. Retrieved 18 January 2016. ^ Stupski, Brian (7 August 2013). "This $1, 000 1962 Max Wedge Dart Is Better Than Nothin'". www.dodge.com. Retrieved 28 January 2019. ^ "What is a Max Wedge?". www/maxwedge.com. Retrieved 28 January 2019. ^ "1962 Dodge Dart 413". www.howstuffworks.com. 22 December 2006. Retrieved 28 January 2019. ^ Shaw, Tom (December 2005). "Anatomy of a Lightweight". Legendary Ford. ^ "Q-Code 1963 Galaxie". www.bangshift.com. 28 March 2016. Retrieved 29 January 2019. ^ "Big Car, Bigger Job: 1964 Ford Galaxie Q-Code". www.barnfinds.com. 17 July 2018. Retrieved 29 January 2019. ^ a b Holder, Bill; Kunz, Phil (2006). Extreme Muscle Cars: The Factory Lightweight Legacy. Krause Publications. ISBN 978-0-89689-278-1. ^ a b Auto editors of Consumer Guide (30 November 2007). "Ford Thunderbolt". musclecars.howstuffworks.com. Retrieved 18 January 2016. ^ Gunnell, John (2005). American Cars of the 1960s: A Decade of Diversity. Krause Publications. ISBN 978-0-89689-131-9. ^ "Chevrolet's 1963 Z-11 Impala". www.348-409.com. Retrieved 18 January 2016. ^ "1964 Dodge 330 Lightweight 'Hemi-Honker'". www.mecum.com. ^ "1964 Dodge Polara Hemi 330 factory lightweight". www.barrett-jackson.com. Retrieved 3 February 2019. ^ "1964 Dodge 330 Lightweight Superstock". www.conceptcarz.com. Retrieved 3 February 2019. ^ "1964 Dodge 426 Hemi". www.howstuffworks.com. 30 November 2007. Retrieved 3 February 2019. ^ Auto editors of Consumer Guide (5 January 2007). "1966 Plymouth Satellite 426 Hemi". musclecars.howstuffworks.com. Retrieved 18 January 2016. ^ "AMC V8 engines - history, descriptions, and more". www.allpar.com. Retrieved 3 February 2019. ^ "Sharp Restoration: 390/727 1968 AMC Rebel SST". www.bringatrailer.com. 28 November 2016. Retrieved 3 February 2019. ^ Auto editors of Consumer Guide (20 December 2006). "AMC Muscle Cars". auto.howstuffworks.com. Retrieved 18 January 2016. ^ Stephens, Bill (25 March 2012). "How About Some Love for the AMX". Velocity by Discovery. Retrieved 18 January 2016. ^ Auto editors of Consumer Guide (9 January 2007). "1968 Plymouth GTX". musclecars.howstuffworks.com. Retrieved 18 January 2016. ^ a b Car Life January 1969. ^ Kelly, Steve (December 1968). "Barracuda on the Line". Hot Rod. ^ Auto editors ofConsumer Guide (10 January 2007). "1970 Plymouth Duster 340". musclecars.howstuffworks.com. Retrieved 18 January 2016. ^ Auto editors of Consumer Guide (11 January 2007). "1969 Chevrolet Chevelle COPO 427". musclecars.howstuffworks.com. Retrieved 18 January 2016. ^ Auto editors of Consumer Guide (10 January 2007). "1970 Chevrolet Chevelle SS 454". musclecars.howstuffworks.com. Retrieved 18 January 2016. ^ Sanders, Bill (February 1969). "Road Runner". Motor Trend. ^ Cheetham, Craig (2007). Ultimate Muscle Cars. MBI Publishing. pp. 12–15. ISBN 978-0-7603-2834-7. ^ Auto editors ofConsumer Guide (12 January 2007). "1970 AMC Rebel Machine". 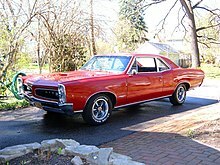 musclecars.howstuffworks.com. Retrieved 18 January 2016. ^ Yates, Brock W. (1983). The decline and fall of the American automobile industry. Empire Books. p. 97. ISBN 978-0-88015-004-0. Retrieved 18 January 2016. ^ Bailey, Katharine (2006). Muscle Cars. Crabtree Publishing. p. 12. ISBN 978-0-7787-3010-1. Retrieved 18 January 2016. ^ "1994 Ford Mustang SVT Cobra". www.caranddriver.com. 1 April 1994. Retrieved 8 February 2019. ^ "1994 Ford Mustang GT - Long-Term Wrapup". www.motortrend.com. Retrieved 8 February 2019. ^ "The '93 Camaro Z/28: Why It Was the First Modern Muscle Car". www.drivingline.com. Retrieved 8 February 2019. ^ "1993 Chevrolet Camaro Z28 - the High Compression Muscle Car Returns". www.oldcarmemories.com. 10 July 2012. Retrieved 8 February 2019. ^ "1995 Pontiac Firebird Formula review". www.caradvice.com.au. Retrieved 8 February 2019. ^ "The Firebird Facts and Trans Am Truths". www.wilsonauto.com. 29 June 2015. Retrieved 8 February 2019. ^ Strohl, Daniel (2 July 2006). "Challenger headed to production". Hemmings Muscle Machines. Retrieved 18 January 2016. ^ "Holden History". www.uniquecarsandparts.com.au. Retrieved 10 February 2019. ^ "Milestones 1960 - 1969". www.holdenhistoricalservices.com.au. Retrieved 10 February 2019. ^ "EH S4 Holden History". www.ehholden.com.au. Retrieved 10 February 2019. ^ "Holden EH S4 (1963) Review". www.tradeuniquecars.com.au. Retrieved 10 February 2019. ^ "Detailed specs review of 1964 Ford Falcon Deluxe Hardtop 200 Super Pursuit Six 3-speed (XM) offered since July 1964 for Australia". www.automobile-catalog.com. Retrieved 10 February 2019. ^ "Chrysler Valiant AP6". www.uniquecarsandparts.com.au. Retrieved 10 February 2019. ^ "Ford Falcon XR Specifications". www.uniquecarsandparts.com.au. Retrieved 10 February 2019. ^ "HK Holden Specifications". www.uniquecarsandparts.com.au. Retrieved 10 February 2019. ^ "Holden HK". www.uniquecarsandparts.com.au. Retrieved 10 February 2019. ^ "Ford Falcon XY GTHO Phase III Technical Specifications". www.uniquecarsandparts.com.au. Retrieved 10 February 2019. ^ "HQ Holden Specifications". www.uniquecarsandparts.com.au. Retrieved 10 February 2019. ^ "Chrysler VH Valiant Charger". www.uniquecarsandparts.com.au. Retrieved 10 February 2019. ^ Nichols, Mel. "HO down the Hume". falcongt.com.au. Archived from the original on 23 May 2013. Retrieved 18 January 2016. ^ "The Ultimate Muscle Car: Enter the Ford Falcon XA GT-HO Phase 4". www.smartbeard.com. Archived from the original on 27 June 2016. ^ Wright, John (1987). "The Final Finest Phase" (PDF). Super Ford's: 20–27. Retrieved 18 January 2016. ^ "Holden Torana LX A9X". www.uniquecarsandparts.com.au. Retrieved 10 February 2019. ^ "Ford Falcon XC Cobra". www.uniquecarsandparts.com.au. Retrieved 10 February 2019. ^ a b c d e f g h i "12 of the Rarest and Fastest American Muscle Cars Ever Made". www.roadandtrack.com. 4 July 2017. Retrieved 11 February 2019. ^ a b c d e f g h i j "Car And Driver Magazine 1990 back issues and used magazines for sale at USEDmagazines.com". www.usedmagazines.com. Retrieved 11 February 2019. ^ "The legendary Plymouth Road Runner and Dodge Super Bee". www.allpar.com. Retrieved 19 January 2018. ^ Severson, Aaron (27 October 2008). "Beep Beep: The Irreverent Plymouth Road Runner". Ate Up With Motor. Retrieved 19 January 2018.